When you’re in second place, you try harder, right? That may not apply in the world of full-size pickup trucks. Ford’s F-150 has been the North American sales leader for decades, but its designers and builders seem determined to keep it there and are not afraid to adopt risky innovations. For example, using a V-6 for serious towing — Ford’s turbocharged 3.5-L EcoBoost engine introduced five years ago — seemed almost sacrilegious. But the fuel-sipping engine’s hefty torque has helped it keep up with the V-8s. For 2017, a re-engineered 375-hp 3.5-L EcoBoost will boost torque to 470 lb-ft.
Ford’s move to an aluminum body for 2015 F-150 models was also unconventional. But aluminum’s lighter weight and durability seems certain to prove its value over the long term. The all-new 2017 Ford Super Duty will also have an aluminum body. 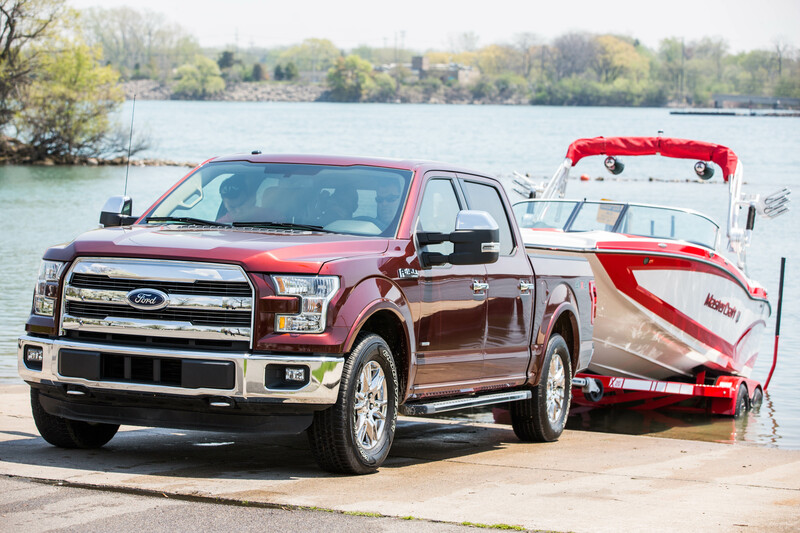 For trailer-boaters, though, advanced towing technologies available on the current F-150 and new 2017 Super Duty are the real dealmakers. As trailer-boaters know, backing up is the hardest part. It’s taken me years to feel truly comfortable controlling a boat and trailer in reverse: steering carefully, moving slowly and using rear-view mirrors to keep the trailer on its intended path. With Ford’s technology, a lot of that trial-and-error work won’t be needed. But hey, I’m not bitter. 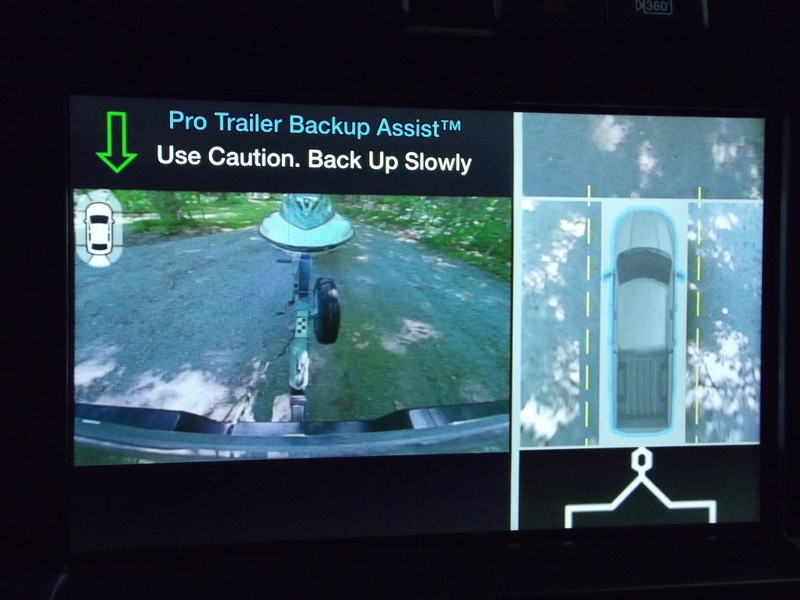 I am happy for trailer-boaters who can take advantage of Ford’s new Pro Trailer Backup Assist feature, first available on 2016 models. I tried it myself last summer on an EcoBoost-equipped 2016 F-150 test truck. It works very well. But it also takes some setup. First, you install a checkerboard target decal in a specified location on your trailer’s tongue. Then take careful measurements from license plate and backup camera to decal, tailgate to trailer ball, and tailgate to trailer axle mid-point. Input that data into a named category in the truck’s trailer data (“Mike’s,” for example). Choose that trailer in the truck’s settings before heading out. 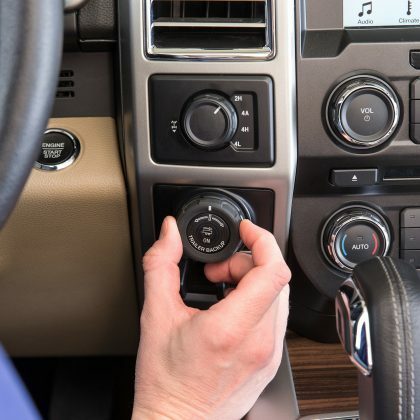 Then, a computer takes over calculations and steering when you shift into reverse. 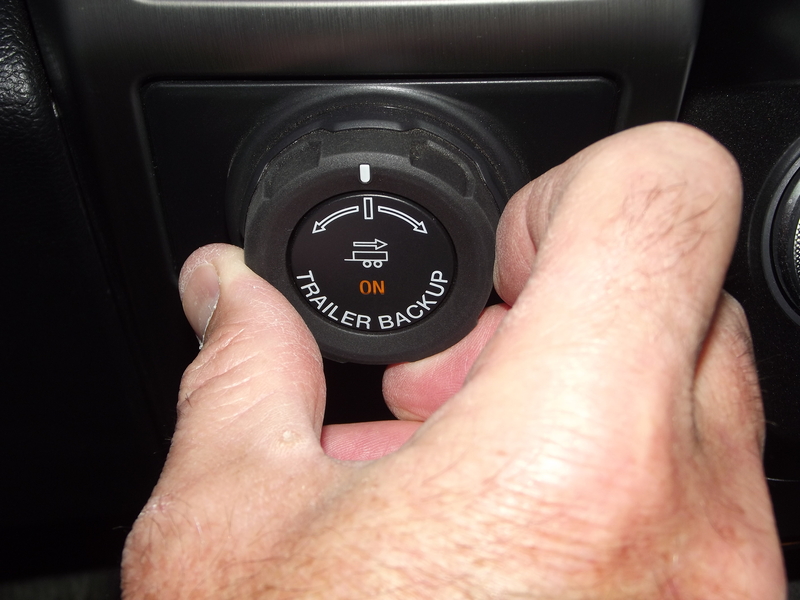 Backing up becomes a simple matter of turning a dash-mounted knob in the direction you want the trailer to move, while monitoring it on a split video screen. 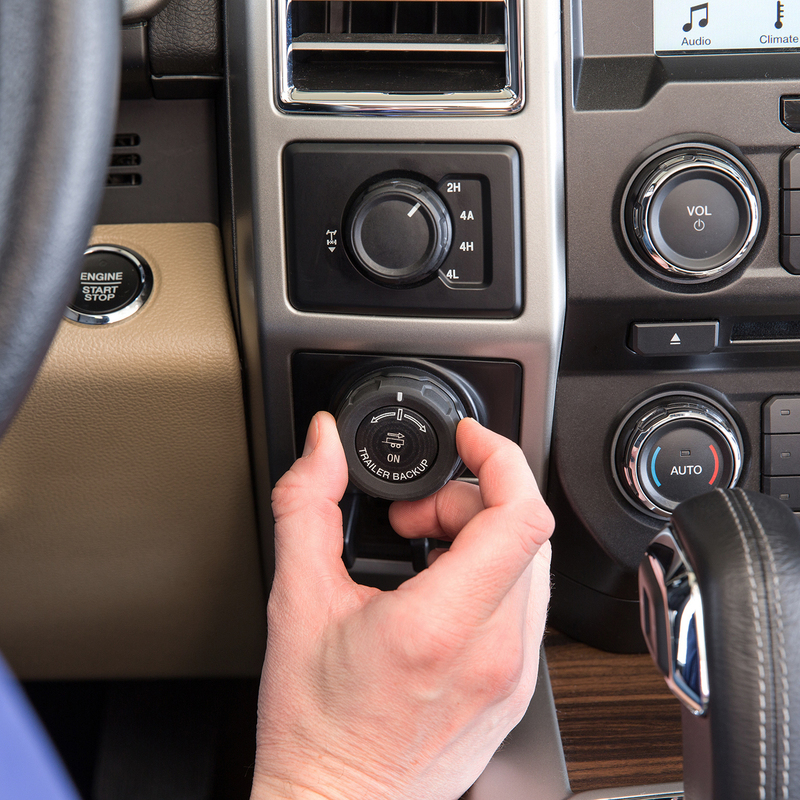 There’s no counter-intuitive steering in reverse. The Trailer Reverse Guidance system on the all-new 2017 Ford Super Duty doesn’t take over steering. 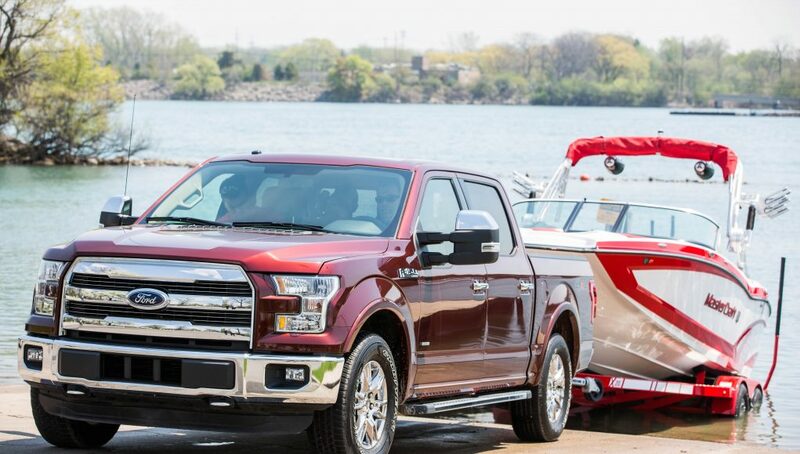 Ford understands that most people who need up to 21,000 lbs of conventional towing capability (up to 32,500 lbs for gooseneck setups) may not want to give up steering duties but do want more visibility. I look forward to trying it out for myself. The guidance system uses three cameras that work together to give drivers a 360-degree video view of the truck and trailer, with colour-coded warning for problems, such as jackknife situations. Four other cameras — including one that can be mounted on the back of the trailer — are available to give drivers even more information on what’s happening behind them. I’m sure Ford’s engineers and designers keep a close eye behind them as well, to see who’s catching up. But their forward thinking and taste for innovation is good news for serious trailer-boaters.